This chapter traces Sorensen’s early work in Washington, DC. He arrived there at the height of McCarthyism and a backlash against the New Deal liberalism that had inspired his choice of career. 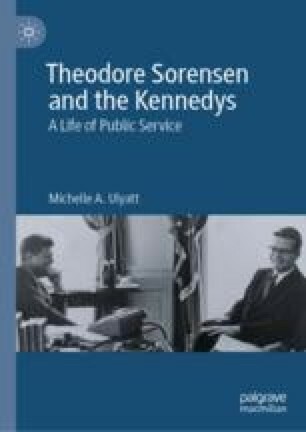 The chapter examines how Sorensen’s roles at the Federal Security Administration and on the Joint Senate House Committee on Railroad Retirement built on his early ideals and allowed him to make connections that proved important to the development of his career. Further, it shows how the liberal Senator Paul Douglas played a crucial role in engineering an introduction to the newly elected Senator John F. Kennedy. It also summarizes Sorensen’s initial duties as staff assistant to Senator Kennedy and examines the rapid expansion of his responsibilities in 1953 and 1954. Congress of the United States. August 5, 1952. “Hearing Before the Joint Committee on Railroad Retirement.” Accessed August 25, 2018. https://babel.hathitrust.org/cgi/pt?id=umn.31951d035913647;view=1up;seq=3. ———. January 9, 1953. “Report of the Joint Committee on Railroad Retirement Legislation.” Accessed August 25, 2018. https://babel.hathitrust.org/cgi/pt?id=uiug.30112104105645;view=1up;seq=4. Ewing, Oscar R. 1969. Interview by J. R. Fuchs, Oral History Interview with Oscar R. Ewing, Harry S. Truman Presidential Library and Museum, May 1, 1969. https://www.trumanlibrary.org/oralhist/ewing3.htm. Kennedy, John F. 1942. “Remarks of John F. Kennedy at an Induction Ceremony for Navy Recruits, Charleston, South Carolina, July 4, 1942.” John F. Kennedy Presidential Library and Museum, July 4, 1942. https://www.jfklibrary.org/Research/Research-Aids/JFK-Speeches/Charleston-SC_19420704.aspx. ———. 1945. “Remarks of John F. Kennedy at the Crosscup-Pishon American Legion Post, Boston, Massachusetts, November 11, 1945.” John F. Kennedy Presidential Library and Museum, November 11, 1945. https://www.jfklibrary.org/Research/Research-Aids/JFK-Speeches/Boston-MA-Crosscup-Pishon-American-Legion_19451111.aspx. ———. 1951. “Issues in the Defense of Western Europe.” John F. Kennedy Presidential Library and Museum, February 6, 1951. https://www.jfklibrary.org/Research/Research-Aids/JFK-Speeches/New-York-NY-WOR-Radio_19510206.aspx. ———. 1953. “The Economic Problems of New England: A Program for Congressional Action.” John F. Kennedy Presidential Library and Museum, May 1953. https://www.jfklibrary.org/Asset-Viewer/Archives/JFKSEN-0893-013.aspx. ———. 1954. “Remarks of Senator John F. Kennedy on the Saint Lawrence Seaway Before the Senate, Washington, D. C., January 14, 1954.” John F. Kennedy Presidential Library and Museum, January 14, 1954. https://www.jfklibrary.org/Research/Research-Aids/JFK-Speeches/United-States-Senate-St-Lawrence-Seaway_19540114.aspx. McGonigle, Jean. 1966. Interview by Joseph E. O’Connor, Jean McGonigle Mannix Oral History Interview—JFK#1, John F. Kennedy Presidential Library and Museum, March 6, 1966. https://www.jfklibrary.org/Asset-Viewer/Archives/JFKOH-JMM-01.aspx. Shribman, David. 1983. “Senator Henry M. Jackson Is Dead at 71.” New York Times, September 3. https://www.nytimes.com/1983/09/03/obituaries/senator-henry-m-jackson-is-dead-at-71.html.